This dinner was hosted at a vacation rental. Here are eight ideas for hosting your own event experience! Invite your top 5 prospects along with 2 of your best clients to share a meal. I suggest a unique and interesting dining experience where the focus is on the meal, vs a power dinner at a steakhouse chain. 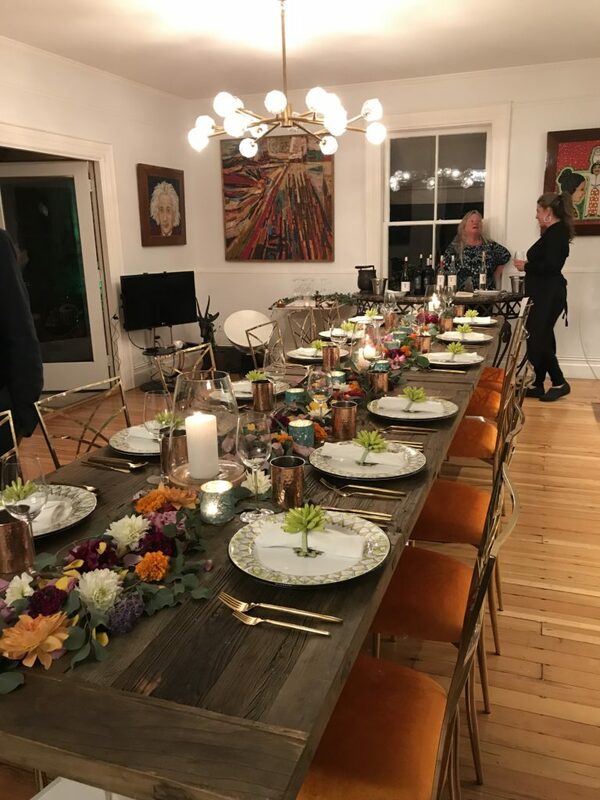 Having dinner catered at your home or a VRBO space sets a warm and inviting tone. The benefit is that you control the whole experience. However a local restaurant with private dining areas and a flavorful atmosphere can work well too. Many restaurants will design menus to match your desired experience, with wine pairings, demonstrations, or shared small plates presented by the chef. Your existing clients will feel included and appreciated by this gesture and your prospects will get a feel for your brand, be able to ask questions of current users, and see how they would be treated as clients. Host a high-level workshop where you delve into one or two deep issues happening in the industry. Make it exclusive to a limited number of attendees and very directed at probing and solving the pain points they may be experiencing. Design a traveling workshop that hits your target markets. Invite your prospects and current clients to a day where they can meet you in person, make connections with other users in their area, and learn more about your product. Every industry has large user conferences that attract hundreds if not thousands of attendees. It can be hard to stand out, but companies can still make their mark! Hosting a small gathering of targeted prospects and clients is a perfect way to enjoy something unique in the city while not conflicting with conference activities. A dinner cruise, cabaret, small concert, or tour can bring your clients together and connect on a smaller scale. Creating a forum for the day-to-day users of your product is a fantastic way to build loyalty, educate your base on updates, and answer and address challenges and issues they face. Make sure and provide specific details on the outcomes anticipated as well as a means to facilitate ongoing dialogue like a group chat or forum. Host an art series in your business lobby, either from local artists or internal staff who make beautiful art. Hang the works just like a gallery and throw an opening reception. The theme can be anything from your company colors, to the local city, to the philanthropies you support. Invite clients, prospects, and business neighbors to walk through your limited engagement showing. Create an annual awards program for your top users and staff. Categories could be the most unique use of your product, the most users on one platform, the largest annual growth using your system or even the farthest client from your HQ. Internal awards might go to the staff member who made the most memorable sales call or developed the best upgrade. Make sure the awards are not dominated by those who only spent the most money or are the closest to the CEO. You want awards that feel fun and uplifting to everyone, even if they didn’t win! Host a sneak peek of an upcoming release or new product. Attendees love to be rewarded for their ongoing interest in your company by being let in on the next “secret”. Not only will they feel excited to be involved, but depending on the stage of release they can provide beta testing feedback and input into the final release. Which of these sounds like the best fit for your business? Have you tried any of these before? I’d love to hear if you have questions about how to tailor them for your brand. Do you think implementing one of these in the next quarter would help accelerate your pipeline? ← Co-hosting an Event: Good or Bad Idea?